For 25 years, Prof. Randy Kyes, in partnership with his international colleagues, have conducted annual educational field course focusing on conservation biology and global health for university students and professionals in countries around the world. Now Kyes and his colleagues provide a similar program to local students at Chief Leschi Tribal School in Puyallup, Washington. 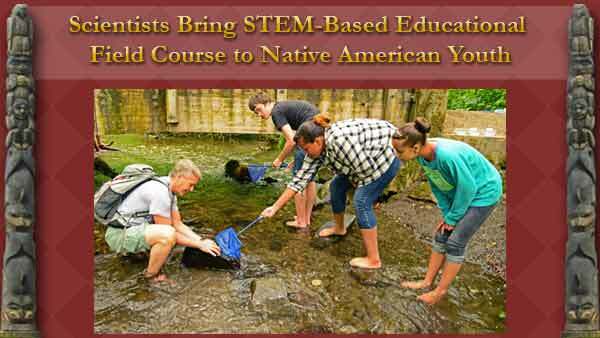 “Given the growing national calls for greater STEM-based education field courses in the U.S., and a desire to engage and inspire our own ‘local’ indigenous youth, we have begun to expand our training programs here at home for students in the tribal secondary schools,” says Kyes. Kyes along with colleague Dr. Pensri (“Elle”) Kyes conducted their first “mini” field course two years ago at the Quilluete Tribal School in La Push, Washington. The course was entitled “College-Prep Field Course in Conservation Biology & Global Health: At the Human-Environment Interface.” Now in June, 2014, the pair conducted the second college-preparatory field course for 14 middle and high school students at the Chief Leschi Tribal School. The field course is modeled after their successful university-level field courses and is designed to give students a “big picture” of the close relationship between environmental and global health. The three-day educational field course consists of daily lectures and related field and lab exercises. Lecture material is presented at an advanced level to expose the students to college-level lectures. Students are introduced to topics such as conservation biology, field study methods, management and conservation strategies, primatology, aquatic bioindicators, the human-wildlife interface, issues in global health, animal research and translational science. Polly Olsen, Community Relations Director of the UW Indigenous Wellness Research Institute along with UW undergraduate Cassie Halls also partnered in the recent field course providing lectures and hands-on demonstrations of local ethnobotany and traditional medicines. 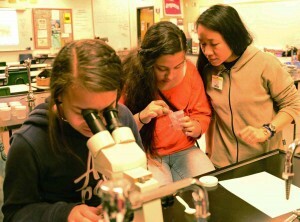 Based on the success of these initial college-preparatory educational field courses, Kyes plans to expand this outreach education program to other tribal schools in the area. Prof. Randy Kyes leads the Washington National Primate Research Center’s Division of Global Programs, is Director of the UW Center for Global Field Study, and Research Professor in Psychology. Dr. Elle Kyes is a WaNPRC affiliate scientist for global field study.